Cylinder-symmetric as well as non cylinder-symmetric parts of a shaft are to be measured with an optical shaft measurement machine. For this, half-bridge transducers are connected to an optical shaft measurement machine in order to extend it with a tactile control function for the non cylinder-symmetric parts of the shaft. The transducer data is to be clearly assigned to the axis position of the shaft measurement device and then transferred to the measurement PC. As the system is meant for use directly in the production it has to be interference-resistant. For this task, the MSX-EC-3701-8 for the connection of Half Bridge transducers has been chosen. Due to its compact design it allows a smooth integration into the measurement system. 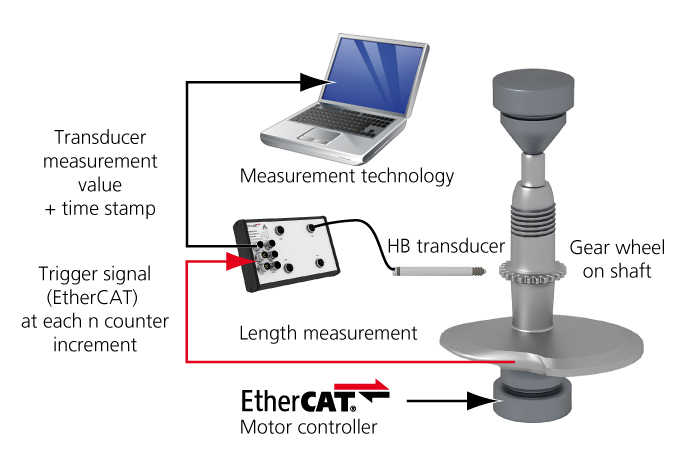 The trigger of the EtherCAT motor controller starts the scan of the non cylinder-symmetric contours of the shaft through the connected transducers with a 24-bit resolution. Continuous data retrieval instead of polling relieves the CPU. Then, a time stamp is added to the measurement values to ensure a clear assignment of the measurement values to the simultaneously acquired axis position. These data packages are directly transferred to the measurement PC.